With just 2 weeks before the big race in Ireland, it was too hard to pass up this local race (10/13/02). My running partner Greg suggested we do it, and I found out that Coach Amy would also be there. 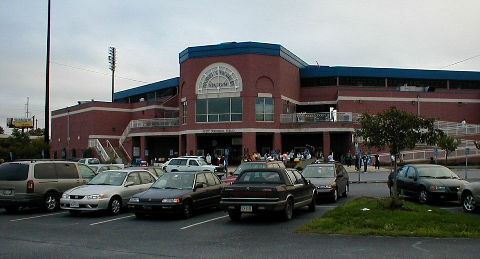 Sunday morning race time was 8:30, with registration commencing at 7:30, so I arrived at the entrance to Frawley Stadium bright and early. Actually, it wasn’t very bright since it was an overcast day with a comfortable 60 degrees, but 97% humidity. 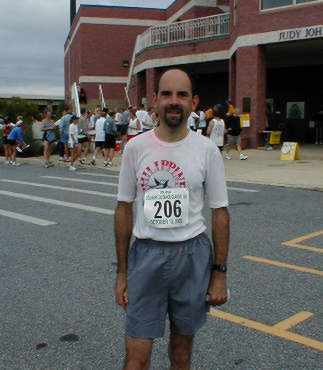 I was only considering this a tune-up for my marathon, so I was loose and not pressuring myself with lofty expectations. The photos on this page were all taken after I completed the run and grabbed a bagel and gatorade for brunch! 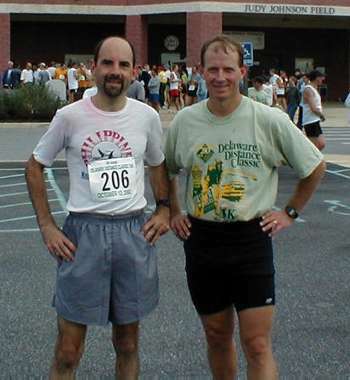 Compared to the Philly Distance Run, with 8,500 participants, this was a much more informal race. But as I noticed within the first mile, these were almost all serious runners, so it’s a good thing that Greg was there to “push” me to maintain a good pace. We ran together the whole way, at a very consistent 8 minute/mile pace that pleased me greatly. The course started and ended in front of the ballpark and looped around the Shipyard Shops and much of the Wilmington waterfront. Nice day with nice people. DDC is sponsored by Pike Creek Valley Running Club. Ray is flanked by coach Amy and her husband Joe. They’re in training for the Philadelphia Marathon in November. Amy captured first place in her age group, and finished just a few strides behind Joe. 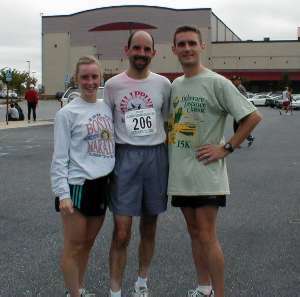 Both of them left Ray in the dust, but we all took a 3 mile cool-down jog after the race. I received positive feedback on my home-made T-shirt!